Furniture grade, (UV protected) 1.5" 4 ways, "pvc side outlet T's." Slip all four ways. Used for many construction projects. Beveled Outer Edges. 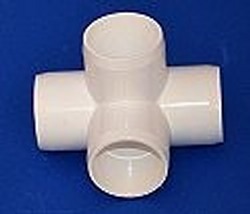 NOT a NSF rated fitting, cannot be used on projects that require plumbing inspections, will not flow water without considerable modifications.